Once you’ve successfully cloned the repository, seq-format-validation directory will appear in your gatk-workflows working directory. The seq-format-validation directory has multiple files but we are only concerned with the WDL and its json. We’ll be running the validate-bam.wdl workflow using its accompanying json file validate-bam.inputs.json. 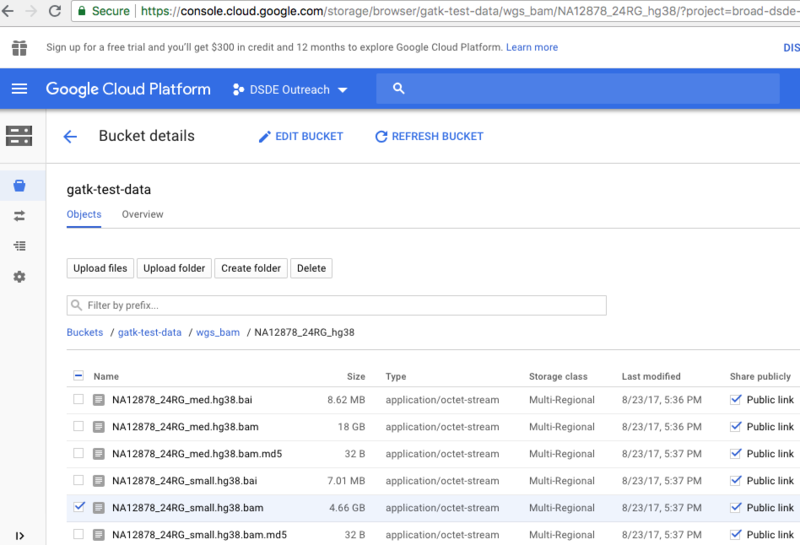 The json contains some required/optional parameters needed to run the workflow, including the path to a test input file located in a Google Cloud bucket. Once you’ve successfully cloned the repository, seq-format-validation directory will be in your gatk-workflows working directory. The seq-format-validation directory has multiple files but we are only concerned with the wdl and its json. We’ll be running the validate-bam.wdl workflow using its accompanying json file validate-bam.inputs.json. The json contains some required/optional parameters needed to run the workflow, including the path to the input file located in a Google Cloud bucket. Since we're running this locally we’ll need to first download any files mentioned in the json. In this case we’ll only need to download the input files but the same instructions can be used for reference/resource files. *Special note, because this is a local demo and the size of the medium bam file is 18 GB, we’ll only download and work with the small bam file. The input files listed in the json file are stated to be in the following google buckets "gs://gatk-test-data/wgs_bam/NA12878_24RG_hg38/NA12878_24RG_small.hg38.bam", "gs://gatk-test-data/wgs_bam/NA12878_24RG_hg38/NA12878_24RG_med.hg38.bam" The base Google bucket name is gs://gatk-test-data, a weblink to this Google bucket is provided in this document under the subtitle Key Google Cloud buckets. We use this web link to take us to the Google bucket of interest in our web browser then use the file path provided in the json (e.g. /wgs_bam/NA12878_24RG_hg38/NA12878_24RG_med.hg38.bam) to locate the files in the bucket. The following files can be downloaded by clicking on the file names. Side note After the workflow completes you’ll see two directories cromwell-executions and cromwell-workflow-logs. cromwell-workflow-logs will have a log file for each job you execute, while cromwell-executions will contain outputs generated by your executed job. cromwell-executions directory level will have a directory for each workflow you’ve run. We’ve only run ValidateBamsWf (title of workflow found in the WDL script in workflow block) so that will be the only folder that you will see.